is taking root quickly and effortlessly. Following Samm's set, Habu will join his partners for a stirring set from The Bakurocho Band, a trio unit that comes highly recommended! 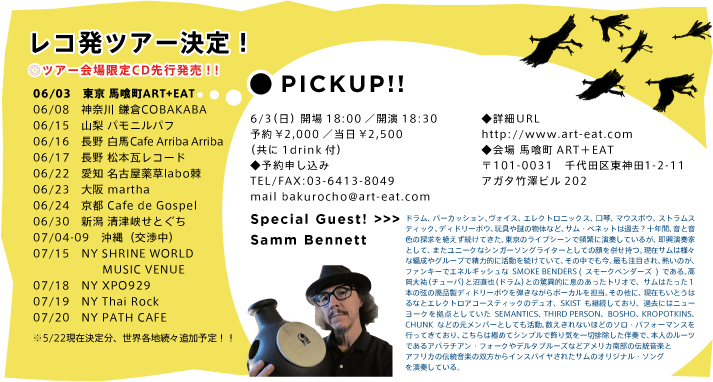 Samm will also join Bakurocho Band for a couple of numbers. Read about (and see videos of) the band HERE. The Dosages is the groove unit of bassist Jyoji Sawada and Samm Bennett. Learn about the band HERE. Catch some videos HERE. This is a brand new band, aiming to pick up where the Ghost Steppers left off, with a focus on Americana roots music, but with an eye toward the future, and an eye toward the improvisational musical moment. The band serves up a slew of tunes from the deep musical bedrock of Tennessee, Kentucky, Mississippi and thereabouts, from musical forebears like Emry Arthur, Roscoe Holcomb, Blind Lemon Jefferson, the Carter Family and more, but with a heapin' helping of good ol' down home improvisation. Yes, improvisation, friends: unplanned, spur-of-the-moment picking and grinning, like grandpa used to do more of than you even know. Anything can happen, cause the Mud Chuck Bobs ain't gonna chain themselves down like they're some kinda roadside crew, workin' a mile and a quarter a day for some law man in mirrored shades with a shotgun, ya'unnerstand? Hell naw! Guitarist Yoshiki Sakurai-san has a solid understanding of and a great feel for American roots music, playing as he has for years with Lonesome Strings. (Sakurai-san is the leader of that band as well). He'll be on acoustic guitar. Samm Bennett will play a stripped-down drum kit and will be singing the tunes in his inimitable manner. If your tastes run toward, say, Mr. John Fahey and some of the creative ways that he interpreted American folk music, you'll like this band. And those of you who love and appreciate basic roots Americana will like this band, if you're a little bit adventurous and don't just want to hear museum-piece reproductions of old-time tunes. And hey, those of you *not* so familiar with American roots music or John Fahey or an improvisational approach or... *whatever*, you may very well enjoy this band, too. that's right! Almost anyone will enjoy this band, except for those people who really like Billy Joel and/or Celine Dion. They will probably not care for it all that much. THU 6/21 : Historic 2nd live appearance of MUD CHUCK BOBS ! music charge: pass the hat! pay as you're able! Back for more! The Mud Chuck Bobs! For info on the band, see the 6/15 entry directly above! who's got more ways to tie up a woman than you can shake a stick at!